I have been working on my posture on the ice for several years now. Looking for information about my misaligned hip has lead me to reading about these other posture problems that have surfaced in my skating: head slightly forward, tendency to break forward at the hips, accentuated curve of the lower back. I’ve learned that these issues are fairly common off-ice among those of us who work at a desk and sit around a lot. 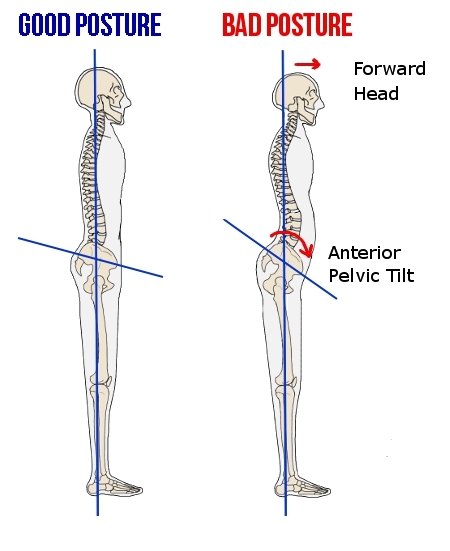 Moreover, it has an official-sounding name: anterior pelvic tilt. If this picture doesn’t scare me into better posture, I don’t know what will. This picture is from a website by a physical therapist that describes the problem and gives some corrective exercises, which I’ve now added to my ever-growing list of off-ice duties. Since the proper placement of the torso is the foundation of any movement, a dancer with a misaligned spine will develop other deadly technique sins. Problems can ripple all the way down to the extremities and upward to the neck and head. The core will be loose, unable to provide essential support. A pelvis that either tips back or tucks under will limit the range of motion in the hips. The article confirms the advice on “tailbone down” and using core muscles to bring the “navel up” that Ari and Laurie have emphasized before. Reminding myself to do this yesterday and today seemed to help with some of the problems I’ve been having on (you got it!) three-turns. I also took to heart the seventh balletic deadly sin, which was “don’t get stuck in a rut” and tried out my new posture on some of the bracket and rocker turns that I haven’t done in a while. Fun, fun, fun. Some more incentive to correct this: among the signs of anterior pelvic tilt (doesn’t quite have the ring of “spontaneous human combustion” but it does sound more official than “sticking your hips out”) are not just the forward tipped pelvis and swayed back, but also an abdominal bulge that is not necessarily fat-related. Oooh, maybe correcting this will give me abs of steel. Or I’d settle for looking like I’ve finally recovered–after thirteen and sixteen years!–a bit of muscle tone after having those strapping babies. Too much information? Too bad. Categories: ouch! and how to fix it | Permalink.